For the longest time I have been dying to know which item on the menu that is. I would stalk people when they were making orders while pretending to check out the meat section nearby, but that didn’t quite work out as pretty much 100% of the time the exchange between customers and a server was in Spanish, which I don’t speak. Then I tried more straight forward approach where I walked up to the counter and attempted to order the dish myself, but somehow ended up with a bag of beef taquitos (they were delicious, nevertheless – although I’m still unsettled by the fact that my hand gesture of “bowl” could be interpretted as a long, cylinderical object). Then one day I wasn’t feeling well at work and left early, which, my colleagues can tell you, happens very rarely as I almost don’t ever get sick. As I was sneezing my way home in the car, all I could think of was the magical stew and I decided to give my luck another shot. 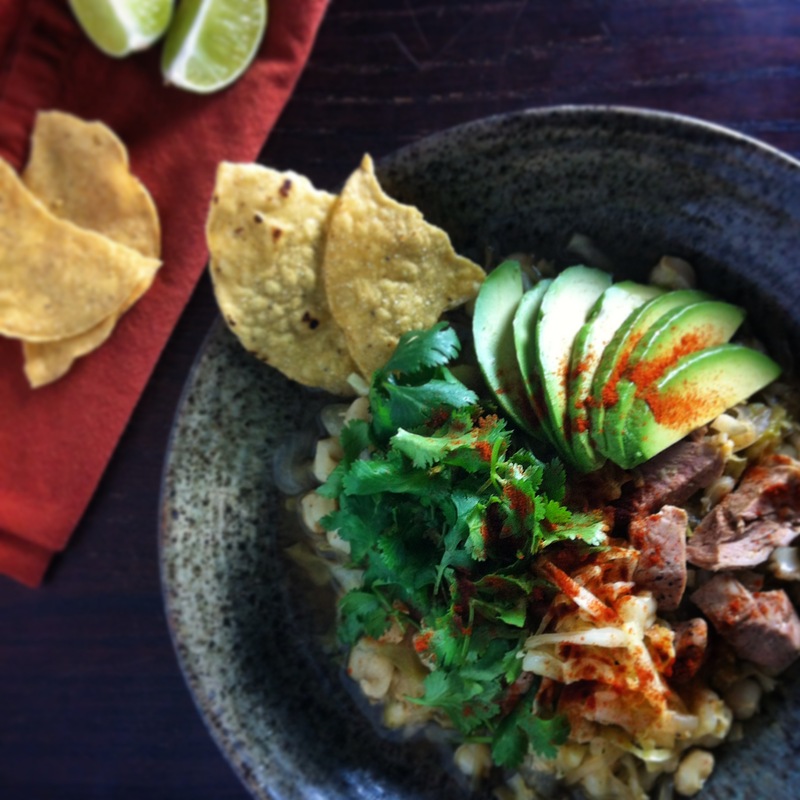 Shortly after, there I was in the store, early afternoon on a weekday when I would not be normally – The deli section was busy as usual with late lunch crowd, but alas the server on the shift spoke English this time and finally told me the name of the dish; Pozole. The magic worked on me. I was well next morning to go back to work, and there was much rejoicing (okay, or not). So this the story of pozole and me. And how everything that happens is meant to be. With all that I have gone through, I think we will be together – and live happily ever after. NOTE: This recipe adds cabbage to the soup while it is cooking although I think typically shredded cabbage is used as topping for pozole. I am keeing the step as I liked how they cook down and absorb all the flavors, but feel free to switch it up as you like. Sprinkle pork with 1/4 teaspoon salt and 1/8 teaspoon pepper and leave it while you are preparing vegetables (except for avocado of course, it turns brown) and measure other ingredients. In the meantime, heat oil in a Dutch oven or a large shallow pan and cook meat until the surface changes the color and no longer sticks to the pot, about 2 minutes per side. Remove and place them on a plate, make sure it catches any juice coming out of the meat. Add oinion and garlic to pot, and reduce geat to medium low. Add remaining 1/4 teaspoon salt and 1/8 black pepper and cook, stirring occasionally, until onion is transparent, 10-15 minutes. During last couple of minutes of cooking, stir chili podwer,ground cumin and oregano into the mixture and stir to blend well. Return meat to the pot (with juice collected on the plate) and add hominy, broth and a bay leaf. Bring to a boil, then reduce the heat to simmer, uncovered, for 20 minutes. Add cabbage, cover and cook for 10 minutes. Remove a bay leaf. Divide into bowls and garnish with avocado, cilantro and sprinkle red pepper powder (or other toppings of your choice). Serve with tostada and lime wedges.